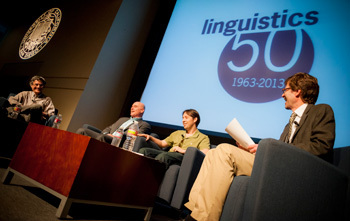 “Linguistics Goes to Hollywood” helped celebrate the 50th anniversary of the UC San Diego department of linguistics. Here are some points of distinction. UC San Diego was novel and different from virtually any other place in connecting the formal study of language with language instruction. Founding chair Leonard Newmark proposed that language is best taught by linguists. This is the origin of the campus’s novel arrangement where language instruction is carried out under the aegis of the linguistics department, while language literature studies are done in the literature department. 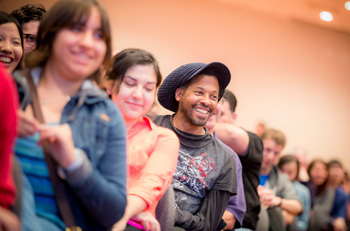 The path-breaking Linguistics Language Program is currently directed by alumnus Grant Goodall. UC San Diego's department of linguistics was one of the first to connect language theory with experimental science. It is now a leading center in the use of neuroimaging and computational modeling, in addition to behavioral methods. The late UC San Diego linguist Margaret Langdon helped to write the first Kumeyaay dictionary. She and her students had close ties to many of the local (and statewide) tribes, and played a central role in the preservation and resurrection of Native American languages that were on the way to extinction — many of which now survive in part due to their efforts. The late Ed Klima and his students were pioneers in the study of American Sign Language and its recognition as a true natural human language and not simply a simple system of gestures. The department was one of the first, in the 1970s, to adopt the revolutionary approach of Noam Chomsky – and then also one of the first to question and challenge it. 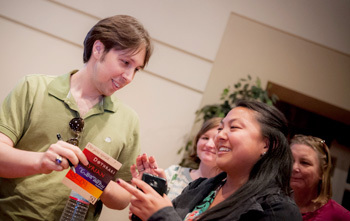 UC San Diego linguists were instrumental in helping to found the campus’s department of cognitive science, the first of its kind in the world. Known among hobbyists and linguists as “conlangs,” constructed languages have a long history. There have been philosophical and scientific reasons, Goodall notes. And there have been such causes as internationalism and world peace—which gave rise to Esperanto (spoken fluently by Goodall since his teens). Then there’s now, when sophisticated audiences demand an unprecedented level of realism and naturalism from their entertainment. Gibberish is a no-go. So are odd-sounding superimpositions on top of an English structure. Only a “real” invented language will do. We can thank Tolkien for that or perhaps Marc Okrand. Today’s conlangs, says Goodall, who teaches the “How to Create a Language” freshman seminar at UC San Diego, may have small vocabularies, but they are otherwise almost completely indistinguishable from natural languages. And their creators are using everything that language scientists have been so far able to discover—along with a good bit of ingenuity. Same goes for Frommer, the creator of Na’vi. He earned a doctorate in linguistics at the University of Southern California before building a career in the corporate world for ten years. He returned to academia as a business professor. While teaching management communication at USC, he co-wrote a linguistics workbook that he would later send to James Cameron as part of his interview for the advertised job in 2005. Like Okrand, Frommer had not created a language until one was wanted for a Hollywood project. Frommer sees “conlanging” as applying more to the prolific enthusiast. Peterson, meanwhile, is the conlanger’s conlanger. A cofounder and current president of the Language Creation Society, he has even written something called the “Conlang Manifesto.” He has been creating languages for the sheer love and challenge of it since he (pressured by his mother) took his first linguistics class in UC Berkeley at age 19. That was long before he auditioned for the Dothraki job. Besides working on Dothraki and two new Valyrian languages for the third season of “Game of Thrones,” Peterson is serving as “alien language and culture consultant” for another show: Syfy’s “Defiance.” If that weren’t enough, he has a half-dozen other tongues and writing systems to his name. Whether they feel they are engaging in “conlanging”or not, all approach their work as a kind of art. And all mention insights into language gleaned from creating one. Okrand—who jokes about first treating Klingon almost like a prop, not that different from a sheathed plastic knife that photographs pretty well but can never be drawn—has, over the years, become quite passionate about the language. Frommer and Peterson seem to have been serious and meticulous about their languages from the start. Frommer, Okrand and Peterson all begin with the structure of the language, long before they start inventing words: Deciding on subject-verb order, for instance, or whether verbs will agree with their subjects. Cases. Tenses. What is the possible palette of sounds? The impossible? 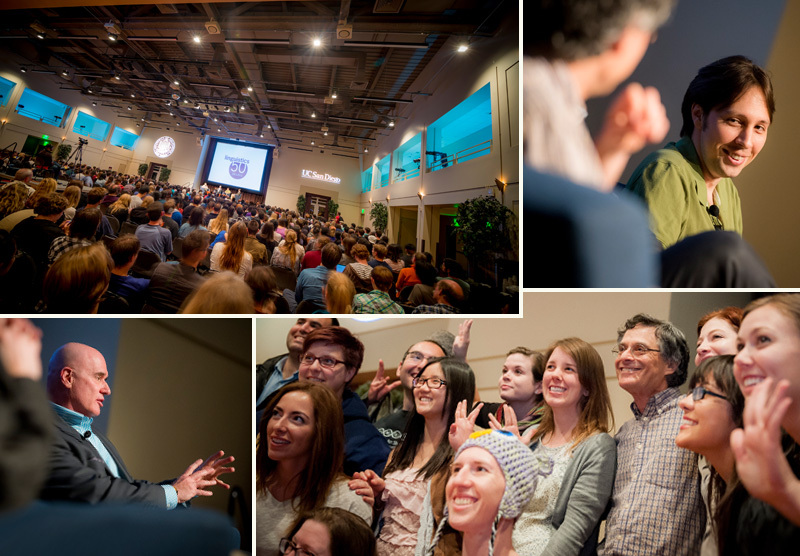 Peterson compares his process, in the beginning, to a kind of programming or puzzle-solving. Later, when working on the lexicon, or the language’s words, he says the closest analogy is literary. He likens it to writing fiction. Peterson also takes into account language evolution, carefully considering possible proto-languages, even if these live only in the archive files of his computer. All three can’t emphasize enough how important considerations of culture, environment and even biology are to their language creations. The four-fingered Na’vi, for instance, have an octal system for counting, not a decimal one. The Klingon surliness and warrior ethos is reflected in their language, and the nomadic horse culture of the Dothraki is in theirs. Frommer considers himself the “gatekeeper” of Na’vi. The speakers of Na’vi request new words and some even propose them, but Frommer remains the central authority, blessing or passing on coinage. All three are very careful not to create “native” words that would be outside the fictional worlds. Frommer speaks of not overstepping bounds into realms that are more properly “Cameronian.” (like: Do the Na’vi have a sense of magnetism to go with the other usual five? ); Peterson is waiting to see if writer Martin will give a clue on whether the Dothraki keep track of time like a week or a fortnight. Yet even without the creators creating words that would be foreign to the fantastic or alien people’s worlds, it is remarkable what the language fans can do, Frommer says, armed only with the small-ish vocabularies and the need or desire for a workaround. Which raises this: Are the creators the best speakers of their own languages? No, they’re not. “If my languages were people,” Peterson adds, “they’d be very disappointed in me.” He’s not as fluent in Dothraki or some of his other inventions as he’d like to be. That’s owing to “a combination of busy and lazy,” he chuckles. He also says that most of his interactions in the languages are online and in written form. Still, even if in-person gatherings are not frequent, there are undeniable communities that have grown up around the languages—Klingon and Na’vi, especially—and around language creation in general. Peterson’s Facebook group of English-speaking conlangers is about 1,000 strong. And Frommer and Okrand both regularly travel the world for organized meet-ups of Klingon and Na’vi speakers, which are distinct from Trekkie conventions or gatherings like Comic-Con. These may not be exactly like the Esperanto clubs of years past, driven by high ideals and recalled fondly by Goodall, but true friendships have also grown out of the more recently created communities. A Hollywood conlang may look frivolous on the surface, Goodall says, but can function just like any other language: It can connect people. People use it to communicate. “Conlanging points to and asks the same deep and fascinating questions about human languages that linguistics does,” Goodall says.